Please refer to our stock # 3267 when inquiring. 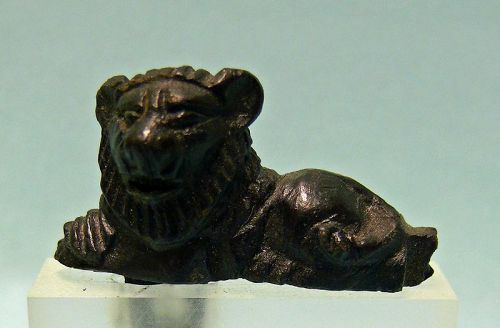 Miniature Roman Bronze Reclining Lion with black patina, attachment, ca. 2nd - 3rd Century CE. Found in the Holy Land. Lion has pleasing smile and curly mane. Loss of one loop as seen in images, otherwise in excellent condition, 1 1/2" x 2" x 1/2", on stand height is 2 7/8" high. Ex: S. Beiner collection, Florida.